The Tet Offensive was one of the most paradoxical of history’s decisive battles. After the death of North Vietnam’s senior General Nguyen Chi Thanh in 1967 Hanoi needed a plan to bring the war to a quick and decisive end. The war had not been going well up until that point and Thanh wanted to scale back the fighting in South Vietnam with American firepower being so overwhelming. With his death and no opposition North Vietnam’s Defense Minister General Vo Nguyen Giap opted to end the war with one swift and powerful stroke. Adopted from an old Chinese Communist Doctrine Giap’s plan called for a “General Offensive” followed by a “General Uprising” followed by a General wearing down of the enemy. But the United States handed the Communist an indecisive defeat. On one hand they battered the enemy militarily but on the other hand they gave them a moral victory. Giap was right on his third assumption. His primary enemy the United States did not have the willpower to sustain heavy loses thus giving The Tet Offensive the dubious distinction of being a victory for both sides. The Tet Offensive would begin on the Lunar New Year and was the most Important holiday on the Vietnamese calander. The exact timing of the offensive was held until the last possible moment to maintain the element of surprise. Giap’s plan was a masterpiece of military deception which started the prior year. Staging fierce bloody attacks on the northern section of South Vietnam and along the DMZ (demilitarized zone) which were pointless and had no military advantage it drew attention away from the Saigon area. A cease fire was declared during Christmas the month before the attacks were to commence and Giap used this down time to move his forces into attacking positions. While the U.S. had its guard down the Communists were moving men, munitions, and supplies into and around the Saigon area. 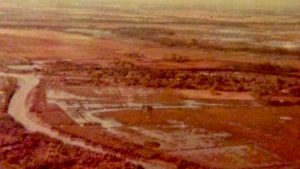 The attack on the Marine base at Khe Sanh was a classic deception perpetrated by Giap that focused U.S. attention on the bloody fighting. The battle became such an obsession for President Johnson that he had a scale model of the base built for the situation room. It was General Weyand commanding the U.S. II Field Forces in Long Binh that realized the ploy. He convinced General Westmoreland to pull his forces back into the Saigon area. Instead of the original 14 battalions protecting Saigon a total of 27 were ready for the onslaught drastically changing the outcome of the offensive. On January 31st the attack was underway in Saigon and by that afternoon the city of Hue was besieged and the Tet Offensive was in full swing. Before the day was over 5 of the 6 major South Vietnam cities, 36 of 44 provincial capitals, and 64 district capitals were under attack. The fighting was over in the nonessential areas within a few days but Saigon, Khe Sanh, Hue, and the Cho Lon district the fighting raged on. Hue was retaken on February 25th, Cho Lon on March 7th, and Khe Sanh on March 20th. The Tet Offensive was over and militarily it was a tactical disaster for the communists. In the face of overwhelming firepower the Vietcong had suffered the biggest losses but Giap gained a moral victory. With U.S. and world sentiment growing unfavorably towards the war the loss of almost 4,000 Americans in just over a months time became a disaster for the Johnson administration. Delta of the 199th was in the thick of the fighting in both the 68 and 69 Tet Offence’s. From Long Binh north of Saigon to the Mekong Delta and Cho Lon District in the south heavy causualties were sustained on both sides. During the 1968 Tet Offensive Long Binh was attacked by a Vietcong regiment sustaining heavy looses. Long Binh, established in 1967, was just 20 mile north of Saigon and was a center of command operations. The communist just 20 miles outside the city targeted Long Binh because of its military importance which housed command units, logistics, medical, and administration centers for all troops operating in the southern provinces. Also containing the U.S. military prison known as Long Binh Jail (LBJ) the center boasted a rail yard and housing for 50,000 troops arriving and leaving Vietnam. The 199th under heavy attack by a regiment sized force fought at the perimeters of Long Binh and repelled the onslaught. The Tet Offensive proved to be the ultimate test for the 199th. 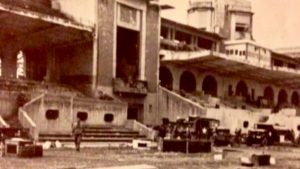 On Janurary 31, the Vietcang had taken Phu Tho Racetrack in Cholon within the city limits of Saigon. The Vietcong were well dug in and also controlled an area 6 blocks around the track. Phu Tho Racetrack is an arena sized facility famous for horse racing in Indochina. Fighting was from house to house throughout Cholon as the Communists held the upper hand and repelled the attack. The 199th sustained heavey losses and regrouped the following day with a new strategy. Fanning out around the racetrack the 199th came in from all sides. After six nonstop days of fighting the Vietcong, either killed or escaped, were ousted and the racetrack was secure on Feruary 5. Although Cholon was secure the fighting continued for the rest of the month. 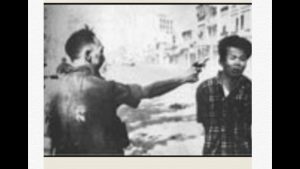 In one of the final aftershocks of the Cholon slaughter Nguyen Loan, a Vietnamese police general, was caught on film executing a suspected Vietcong prisoner. This image became one of the most famous images of the Vietnam War and fueled outrage throughout the world. shock waves around the world. Phu Tho Racetrack, fighting was from alcove to alcove. Operation Toan Thang was an area of operation patrolled by a combined task force. The 1st, 9th,25th, and 199th infantry units were deployed to counter what was to be known as “The Mini Tet”. The Vietcong had infiltrated the city limits and held key locations. The most serious threat came as two VC battalions captured the Y-Bridge linking downtown Saigon with the Nha Be District. It took 6 days of hard fighting for the Americans to secure this vital artery leaving it the most costly action of “The Mini Tet”. The Cho Lon district had been secured and Delta was sent south to stop the Communist reinforcements from infiltrating the Saigon area. The regiment sized attacks were ongoing leaving us to believe that the reinforcements were no less formidable. Doubling up on our normal sized unit we took choppers to a suspected infiltration point and divided the area in two for greater coverage. Delta was back down to our normal eight men and set up for a night ambush. It was an open area of rice paddy mud, dirt dykes, and scrub tree lines of small growth. Spreading out and resting until dark we took turns on guard duty while keeping a low profile. From our past experience we knew the Vietcong were known for their night movement and setting up a night ambush always gave us the element of surprise yet left us vulnerable and alone. Alone with your own thoughts on guard duty at night in the middle of nowwhere was alone as alone can get. Sometimes I imagined I saw things and suddenly they were gone as I rubbed the tiredness from my eyes. I had turned nineteen but in a place like this it was the same as being eighteen only a day later. I hadn’t lived long enough to have many thoughts other than high school and all that it encompasses. No kids, no marriage, no jobs so what do I think about to keep awake? What if I die before I’ve even lived? It was sad to think that I haven’t lived long enough to have many meaningful thoughts and so I stopped thinking and concentrated on the task at hand. Perhaps that’s why war is a young mans game, nothing to loose. I watched one lonely figure come out of the woodline in a slow methodical scrutiny of the area. I’ll wait I thought and see what he is up to and so I followed his every move. A second, a third, and a fourth just kept inching there way out of the woodline. I quietly woke the next man and he in turn followed suit. No mans land was one hundred yards of a system of open rice paddies and dirt embankments or dykes with a village and livestock off in the distance. 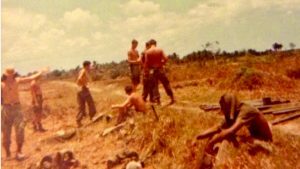 There was plenty of room for this small Vietcong unit to negotiate so we simply kept very quiet waiting to spring our ambush. Suddenly another figure appeared followed by a processional that spaced themselves in twenty foot incriminates. They fanned out across a football sized would-be battle zone. They just kept coming. Appearing to be in no hurry they mingled about in a slow cadence taking the time to analize each step. Fighting in their own backyard they knew every nook and cranny and examined it carefully suggesting that the area was mined. Again they moved and again more appeared repeating the same movement. I was watching a slow motion rerun of the same scene only now they were increasing in numbers with every passing moment. Now at the fifty yard line they stopped again. My best guess at this point was that it was at least a platoon sized unit and they were loaded with gear. Mortars, munitions, RPG’s (rocket propelled grenades), and rifles was only what we could see. The others were carrying boxes which could contain anything. This was no ordinary Vietcong unit and by the looks of things they meant business and could be meeting another unit for resupplying the offensive. They still were not out of the woodline yet and it was hard to tell just how many there were. We were outnumbered ten to one at least and still counting as they moved even closer. Now there close proximity eliminated any type of air strike. We held out breath’s as the hours slowly ticked away. As if waiting for an assignment they lingered and even lit up cigarettes and squatted in circles of eight to ten man groups. We couldn’t open fire and we couldn’t just let them walk into our position and so we held our breaths. Opening fire on one end of the unit or another would bring the remaining men on our flank and moving was out of the question. Either option was a death wish and so we waited throughout the night. Moving straight into our laps they carried an arsenal to sustain a Mini Tet for an extended period of time. I could smell them in the still heavy night air and I knew we were in for a fight. This fight was all on us and it was going to be a good one. They inched closer across no mans land to encounter two water buffalo’s at an intersection of dykes. The corner of two rice paddies and the misplacement of two water buffalo’s would determine our fate. These beasts of burden help to sustain life in the rice paddies but are known for their stubbornness and strength. Not to deal with these creatures the Vietcong viered off course and change direction at the last possible moment and spared us the fight of our live’s. We waited until they were out of range and called in an air strike ending the longest night of my young life. Now I had something to think about. There was a saying, “we own the day but the night belongs to Charlie.” Shuttled around during the Tet Offensive I took this picture on my way to an operation. Our eight man unit was transported by day to set up ambushes by night. If you were on the first chopper it was your job to secure the LZ (landing zone) for the next arrival. 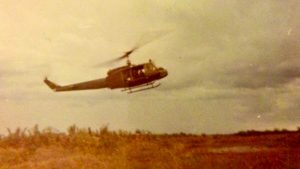 This Huey helicopter carried six to eight men and was the backbone of our unit. These dykes or borders to the rice paddy’s were ideal to hide behind especially when we were getting shot at. Here my unit arrives during daylight so we can decide the best place to set up while protecting ourselves for a night ambush. Vietcong movement was usually at night.